I had always hoped that McKinney Ave would develop the way Knox has (but X4)- from the Crescent down to West Village. Sort of one long shopping / dining destination. Having a McKinney Ave address comes with a premium rental price yet there is very little on McKinney Ave to justify it IMO. Knox / Henderson is far more attractive to me! Awesome, so glad they kept the drug store! I do wonder, whether the soda fountain business will return. All the press refers to them fixing up and keeping the HP Pharmacy building...not necessarily the business. Hope the building is preserved and the business is allowed to return. Weir's will relocate temporarily when construction starts — probably in early 2019. The building — just a block from the Katy Trail — will take 18 to 24 months to complete. Looks like they plan to start in early 2019, with an expected completion in early 2021. I'm really glad that the number of projects seems to have slowed down, but the quality seems to have gone up. LongonBigD wrote: I just think this is bait trotted out to get what they really want approved (increased density than currently allowed). We shall see what the final result becomes. Late update on this project proposed at McKinney & Hester. Somehow I missed this followup back in December. They had proposed rezoning signs on the property that were only up for about a week back in April. Anyone know what the latest is? Is that McKinney avenue on the NE side of the intersection with Hester? R1070 wrote: Is that McKinney avenue on the NE side of the intersection with Hester? Yes, taking about 60% of that block, including the large complex mid-block and the two other properties just south. Leaving only the small apt/condo complex, the body shop and Chelsea Corner on the north end of this block. Shame. Instead of getting a taller product which would add a little bit of variety, we get a cookie cutter rectangle just like what went up across the street. Is it really so hard to diversify the exteriors of each 'section' of these buildings to at least make it appear as though it is a string of unique structures instead of one massive building? It seems like such an easy thing to do, yet it almost never happens. I can't help but think that some of these will resemble the 'government housing' style architecture in twenty years or so. You make a good point about varying the exterior frontage. This one and the proposed new build at Cole & Armstrong, both are almost a city block long and could use some elevation variation. muncien wrote: It seems like such an easy thing to do, yet it almost never happens. Uh no. Adding stucco to 1/2 of the building does not qualify as making the facade look varied. Every development that tries to save cash does this.. I'm still pissed that the city allowed that. That's not historical and I still don't know how they got around that . It can be done however. Look at the Arrive apartments in West end station. That's how you do it. But developers will go with the cheaper option more times than not.. In the current proposal, affordable housing means that families making 80 percent of the area median family income — $73,400 for a family of four — would be able to rent a unit for between $896 and $1,450 monthly. Those rents would change as the median income of the area changes. But the units would have to be kept within "affordable" ranges for a set period of time, such as 15 years. New Wild About Harry’s parking signage going up in front of the former Little Katana on Travis st. They had hinted at staying in the neighborhood so this looks to be the spot. Makes me wonder what Dell/Retail Connections plans are for the rest of the building. Long-term leases to Harry’s and others or just something to cash flow until they kick off a development plan or maybe wait for the next cycle. There's no way they would build out the restaurant in that space for a short term lease. I wouldn't even mind if this building stayed, I just want the old 7 Eleven to go and that lot be redeveloped. I wouldn’t exactly call Harry’s old finish out deluxe. Maybe there is enough restaurant stuff left in the Katana space to restart with minimal out of pocket. I work on Knox. I have seen nothing. No sign of anything from what I can tell visiting the area. I wonder if some sort of wait is because related to utility work is behind this. Sylvan Blvd from SIngleton to I-30 was delayed while the city and AT&T argued over utility changes among other things. Those companies sometimes have to program those things into their budgets too delaying city projects. Matt777 wrote: It's clear that the Highland Park Soda Fountain building will get some much needed restoration, but does this mean that the restaurant will close??? It is currently the oldest restaurant in Dallas and quite charming. It would be a terrible loss to see it go. Highland Park Soda Fountain is about to break some hearts. The 106-year-old institution is closing its longtime Knox Street location to make way for the construction of a 12-story office building with retail on the street level. It's unclear when or if the soda fountain will reopen. But there's still time to come in for a milkshake and a grilled cheese sandwich cooked in view of customers who sit at the long counter lined with stools fastened to the floor. Eating at Highland Park Soda Fountain is an American-made experience that's slowly fading away. "It's an emotional thing for customers and for us," said owners Sonny Williams and Gretchen Minyard Williams. The last day will be Sunday, Sept. 9. This is a little sad, survived for so long. Ugh. I can't believe this. One of the only restaurants in Dallas anywhere near that old.... and an institution. Nothing is sacred in this city. My hope is that Weir's can revive it after they finish their new store, in the original location, refreshed and use it as their store cafe. Its one of those institutions that were holding on to a past that I often wonder how the business was working anyway. Sometimes when these places close from changes like this the owners just have no interest in managing anymore and they won't tell everyone there wasn't profit in it. They do it because people love it but eventually you just move on. I could certainly see new owners come in and restart it with a mixture of the classics the place was known for and try to mix in some new ideas to carry the brand into the future. Soda Fountains were kinda like Royal Blue groceries. They had food and some light groceries and with Trader Joes taking the grocery mantel they could still mix some local stuff in I am sure and find a nitch worth pursuing. Matt777 wrote: Ugh. I can't believe this. One of the only restaurants in Dallas anywhere near that old.... and an institution. Nothing is sacred in this city. My hope is that Weir's can revive it after they finish their new store, in the original location, refreshed and use it as their store cafe. I suppose if there is any viable option this might be it, seems like when they close something and then reopen after a long pause that something is somehow lost in the transition that just never quite feels the same. There should be more places like this, not fewer. I am sad and stunned. There should be places besides chains to get good chocolate malts. I didn't know members of the Minyard family were involved with the business. Strange how 2 long-running local businesses go away and the same people were involved with both at some point. The Pharmacy/Soda Fountain will be missed. Was able to stop by the Soda Fountain yesterday. Packed! Workers there told me that it's been that way ever since the announcement. I ended up enjoying a chocolate malt to go. So, for those wanting a malt, grilled cheese, or whatever else is left on the menu, expect to wait and bring your patience with you. For those who don't want to visit the post back in November with all the renderings I will post them again. As long as Weir's doesn't let CVS take over the soda fountain space I will feel ok about it. Also as some further context Weirs was the one who was against the Knox street redo planned to make the street slower and more pedestrian-oriented because they had an office tower project in the planning stages. I can see some of the top restaurateurs in the city clamoring to take the soda fountain space… Of course it would also make a really cool 2-Level Nike Running concept store, or some other destination type retail. itsjrd1964 wrote: There should be more places like this, not fewer. I am sad and stunned. I say this all the time, but I also acknowledge that some of these businesses refuse to evolve. Oak Cliff just lost Aunt Stelle's Sno-Cones, and Wild About Harry's almost disappeared. Norma's Cafe has done an excellent job of staying relevant, and I love going to the location on W Davis although mostly for the nostalgia factor. Evolving the brand and expanding to new locations is essential. I would love to have a place like Bubba's on Hillcrest closer to home rather than another Raising Cane's. I took these photos of the Highland Park soda foundation building this past weekend. This building truly does need some TLC. I can see why the fountain would have to close in order for the renovations to be completed. Also, it would be very difficult to keep it open while a 12 story building (with underground parking) is built right next to it. I know it's done elsewhere. Here's hoping they can return when the construction is complete. Anybody know what the status is of Alliance Residential's block size project south of Cole and Armstrong? I believe it received planning approval in the Spring. Has it gotten final approval since then? They worked hard with the neighbors to “fit” in but if the final decision has posted on the forum, I missed it. Also, anybody know what is going to be called? Follain will be opening soon in the previous Wild About Harrys spot on Knox. Last edited by LongonBigD on 25 Nov 2018 16:51, edited 1 time in total. Last edited by LongonBigD on 25 Nov 2018 20:35, edited 2 times in total. LongonBigD wrote: Has this been posted already? I believe so. This is new modern hardware store. huh? are you thinking this is the new RH gallery? 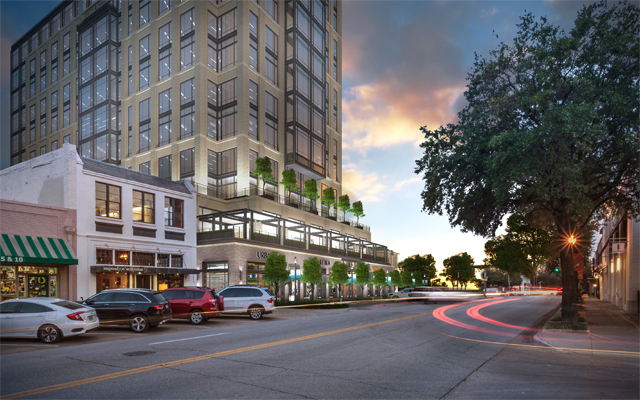 this image is the new Weirs tower and retail on Knox/Travis, a block west of the RH on Knox/ Cole. Yeah I think you're correct! I like the change to parallel parking on Travis, but they really need to reduce that curb radius at the Knox/Travis corner. They'll be rebuilding it anyway, so might as well do it right (and put in directional curb ramps instead of one giant diagonal one). The Kozy will be leaving McKinney Ave for Lakewood (lease not renewed). It appears that whole strip with Knox Street Pub is being cleared. Any idea on what would replace it or is it a remodel? there's a LARC salon right next door that's being moved to B&F Flats on Fitzhugh Avenue--I live very close by. So yes, if we see that Enterprise rental building shutter, then something big(ger) is probably happening there. Makes sense. It's a bit of a dumpy, low-density corner that could be much improved. Also, speaking of B&F Flats on Fitzhugh, I've been waiting for the vacant retail space to fill up, because I really, really want LDU Coffee (excellent Australian cafe making the best flat whites in Dallas) to stick around in there! El Bolero is now open, and F45 (some kind of personal training) and LARC salon will round out the retail space in that area. I thought the Enterprise spot already closed. R1070 wrote: I thought the Enterprise spot already closed.